Click Miniature Sea Paintings to shop my range of Mini Seascape Paintings. Long before I became an artist, I sculpted my feelings with poetry, always searching for a language that conveyed the beauty of the ocean and its ferocity. Growing up near the North Sea, from a family with strong Maritime ties, I have always felt a deep, visceral connection. One of my earliest memories, aged around 3, is my Grandfather taking me on board his trawler anchored near the mouth of the River Tyne. He was a seasoned engineer and was often elbow deep in black engine oil. I can remember overwhelmingly the smell of the oils almost sweet, metallic tang and the age-old ripe linger of fish. I can recall the mostly bearded crew being so amused as I gingerly edged along the metal walkways. Every little sway and swell of the water I could feel in my bones. My father, now land-based, had spent the 1950’s at sea. He was an officer and Navigator in the Merchant Navy and was a tome of fascinating stories of his years travelling the world. He was also a keen photographer and would often show us beautiful black and white photographs of the foreign cities and ports he had seen, now changed and much developed and of course pictures of vast but unchanged oceans. Growing up as a child in the 70’s, near a seaside town, meant plenty of days out at the beach at Whitley Bay or exploring the rock pools at the south side of the Tyne at Marsden Beach. 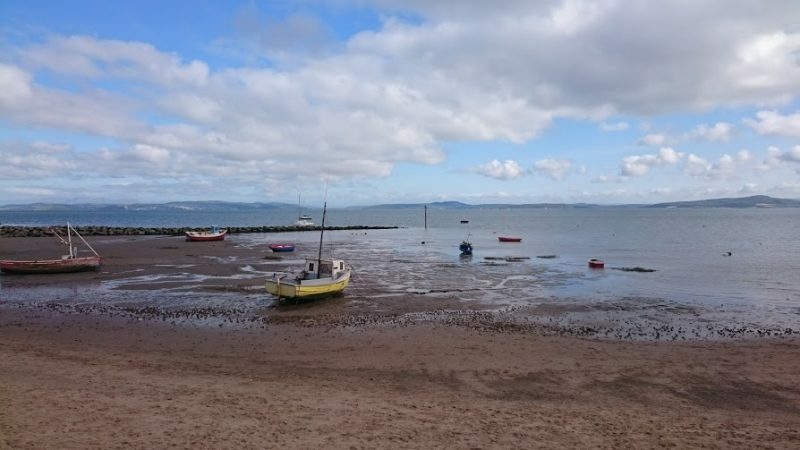 Today I’m lucky to still be so close to the ocean living in a village overlooking Morecambe Bay. It’s one of the most beautiful seascapes I’ve ever seen and will continue to be a huge inspiration and influence in my paintings and poetry. I’ve often been asked why I paint miniature seascapes. It happened a little by chance. I’d begun doing a series of thumbnail sketches to improve my understanding of the anatomy of the sea. This is a very common practice for artists. 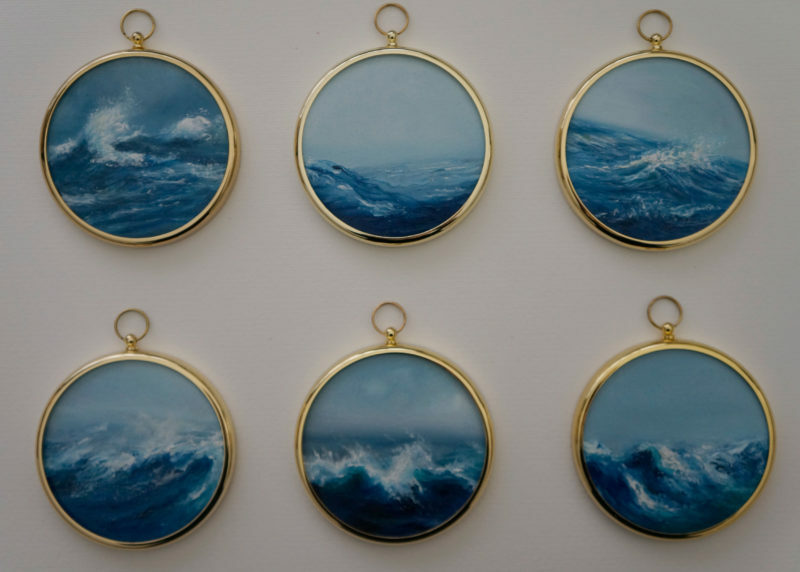 However, I couldn’t resist the urge to turn them into mini paintings which my friend and keen art collector insisted I frame in tradition miniature round frames for her collection. The results were beautiful. These are absolutely stunning. So glad I stumbled on your website. Looking forward to receiving my order, they’ll look beautiful in my beach house. My wifes friend recommended you to me. She has several of your porthole paintings. They’re beautiful. Do you take commissions?